We tested out a Moso Natural air purifying bag when we noticed that our car was beginning to smell way too much like our dog. We put the bag in the sun for a few hours and then popped it into the back near the kennel and when we got into the car a few hours later, no more dog smell! We were sold. We've had the bags in various sizes available in our San Mateo shop and have gotten great feedback from lots of other customers. "My son's room was really bad. I put the Moso Natural bag in the sun for a few hours and then carefully opened my son's bedroom door and tossed it all the way in. The next time I opened the door, I could breathe! " Available in four convenient sizes, the Moso Bag dehumidifies to help prevent mold, mildew and excess moisture. What is the Moso Bag? The Moso Bag is a natural, extremely effective air purifier that absorbs odors, bacteria, harmful pollutants and allergens. 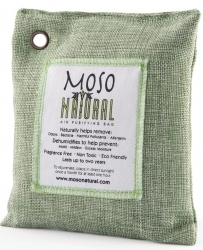 The Moso Bag also dehumidifies, which helps prevent excess moisture, mold and mildew. There is just one ingredient inside the Moso Bag – 100% Moso bamboo charcoal. This incredible natural product is made from Moso bamboo, a species of giant timber bamboo. How is Moso bamboo charcoal made? Converting Moso bamboo into bamboo charcoal takes several weeks during which the bamboo is dried and then treated at high temperatures in a kiln. The resulting bamboo charcoal has millions of tiny, porous holes through which it absorbs impurities and excess moisture. What types of odors and pollutants does the Moso Bag absorb? 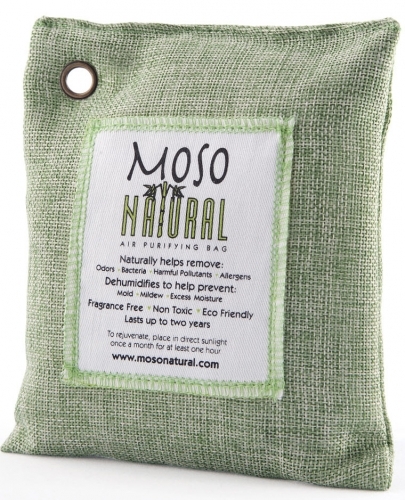 The Moso Bag absorbs unpleasant odors such as smoke, pet smells, paint and mustiness. It also absorbs pollutants. Bamboo charcoal has been scientifically proven to reduce harmful chemicals including formaldehyde, ammonia, benzene and chloroform gases emitted from such items as paint, carpeting, furniture, air fresheners, chemical cleaners, rubber and plastic. Why use the Moso Bag? Many conventional air fresheners contain dangerous chemicals such as formaldehyde, petrochemicals, p-dichlorobenzene and aerosol pollutants. We created the Moso Bag as a safe and natural alternative. How long does it take for the bag to work? It begins working immediately after you open the bag. However, because it doesn’t give off a scent like an air freshener, it can be difficult to know if it’s working right away. But you’ll know soon. In just a few days, you will notice major improvements. Within a week, odors will be completely neutralized. What is the best size Moso Bag for my space? The Moso Bag is available in four sizes, to best fit your needs. For optimal results, position the Moso Bag in the appropriate area for the bag’s size/purpose; it is safe to place on any surface. *50g Mini Moso Bag (package of two): Covers 10 square feet, which is great for small contained areas like shoes and boots, gym bags, lockers, laundry bags, trash bins and luggage. 75g Moso Bag for the Refrigerator: Better than baking soda! Absorbs odors and keeps food fresh longer. Ideal for cool storage spaces such as refrigerators, freezers, wine coolers, etc. *200g Moso Bag: Covers 90 square feet and is excellent for small spaces including cars, boats, closets, bathrooms, pet areas and laundry rooms. *500g Moso Bag: Covers 250 square feet, making it perfect for larger areas such as kitchens, living areas, bedrooms and offices. Tip: Place in newly remodeled rooms to reduce unpleasant odors and toxins!